In our continuing conversation with this year’s English-language Governor General’s Award winners, today I speak to Rhonda Mullins, winner of the 2015 Governor General’s Award for Translation for Twenty-One Cardinals (Les héritiers de la mine) by Jocelyne Saucier. 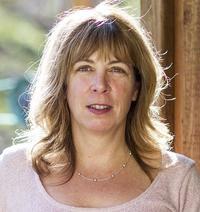 Rhonda Mullins is a translator whose work has been shortlisted for previous Governor General’s Awards, including her translations of Élise Turcotte’s Guyana (2014), Hervé Fischer’s The Decline of the Hollywood Empire (2007), and Saucier’s And the Birds Rained Down (2013), which was also a CBC Canada Reads selection in 2015. Rhonda Mullins studied and has taught translation at McGill University in Montréal, where she currently lives. You’ve been a previous finalist for the Governor General’s Award. What was your first reaction to finding out you’d won this year’s Governor General’s Award for Translation? I cried. It took me a couple of minutes to collect myself and then I was fairly stunned for the rest of the day. For the rest of the month in fact. Translation is a delicate, demanding art. Were their particular challenges you encountered translating Jocelyne Saucier’s book from French? The book had many characters and many voices, so trying to get across a voice for each character was tough. Also most of the characters had nicknames, which, as nicknames often do, offered insight into their character or events in their lives. When Jocelyne was developing the characters, she had come up with a legend of the nicknames and what their meaning and origins were. In some cases the back story wasn’t essential to the book, but still tried to follow it anyway. The story is also suspenseful, so I wanted to make sure that came across in the English. That can be just a matter of word choice, the length of sentences, rhythm, that sort of thing. The book tells the story of the twenty-one Cardinal children, who gather to celebrate their father after many years. How difficult was it for you to bring to life the various voices of the Cardinal clan? It was difficult and then eventually it became not difficult. You feel like you get to know the characters after spending the better part of a year with them, so at first I think you work at it and then it just starts to happen. Although when we were editing the book, we did end up asking who was speaking a lot of the time, just because you forget where you are in the story. But as a reader, I loved that structure of being passed along from one narrator to the next. Despite being an officially bilingual country, it’s been said that Canada is a land of two solitudes, with English Canadians often unaware of the diverse, accomplished artistic creations produced within French Canadian cultures. What role do you think translation plays in bridging the divide? Is there more that can be done to cross-promote literature across linguistic communities? It’s nice when a book from French-speaking Canada gets visibility in English Canada. This year my translation of one of Jocelyne Saucier’s books, And the Birds Rained Down, was a Canada Reads selection. That was at the beginning of the year, but I’m still running into people who say they’ve read it or are going to read it because of Canada Reads. And it was one of two translations in the running, Kim Thuy’s Ru being the other, translated by Sheila Fischman. It ultimately won. It’s nice when a book from French-speaking Canada gets visibility in English Canada. There’s also a translation on the Giller shortlist this year, Samuel Archibald’s Arvida, translated by Donald Winkler. And then of course there’s the GG translation category. So these high-profile events help attract attention and perhaps get people more used to the idea of reading translations, something we shouldn’t be frightened of in this country. Is there more that can be done? Sure. But I’m not sure I’m the best person to answer this question. 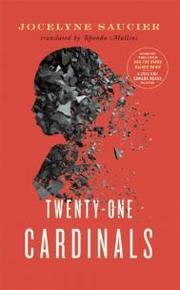 The Globe and Mail called the novel “an ominous, brooding novel about familial love.” Twenty-One Cardinals joins a number of high-profile, French-language works of literature that have risen to prominence in English Canada this year. In your opinion, why has the novel achieved such widespread acclaim, both inside and outside Quebec? Ominous is a good word for it. I remember when I first read it getting to a certain point and thinking “uh-oh.” Again, Jocelyne is a very good storyteller and in each of her books she manages to create a world that you can immerse yourself in. Of course I spent an awful lot of time with a book I’m translating, so I end up feeling like I can move around in space inside the story, but I think anyone who reads one of her books, in English or in French, ends up inhabiting the world she creates for the time they spend there. It’s a special talent she has. When the old coot with the nicotine-stained teeth asked the question, I knew we were headed back to the good ol’ days. I have no problem with that. I love it when I feel our family slip into the conversation and I know someone is going to ask the question. My family has always fascinated me and given me a leg up in conversations. We’re nothing like other families. We are selfmade. We are an essence unto ourselves, unique and dissonant, the only members of our species. Livers of humdrum lives who flitted around us got their wings burned. We’re not mean, but we can bare our teeth. People didn’t hang around when a band of Cardinals made its presence known.